I meet up with Mindy & Mun Yi quite often...usually once every month or two. But as my due date is getting nearer, we have been meeting up more and more often. Not sure what is the urgency...but I guess it is me - this kiasu mum-to-be afraid that I don't have time to go kai-kai anymore once Little Angel is out! 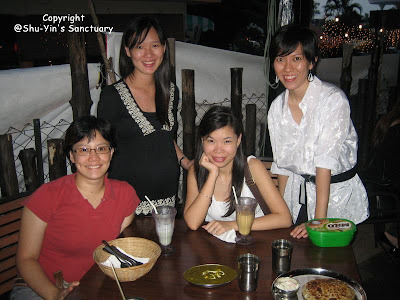 Anyway, the four of us had a great time just chatting and eating at Sri Ananda Bahwan last Friday. As usual, I ate like a glutton that night...because Mun Yi ordered the wrong fish and the fish turned out to be such a big fish! And Shuey left early and abandoned us there with all the food on the table! Look at my oily face - I am the only one who seemed to be sweating like a pig there although our table was just under the fan and the night was not very hot! good thing shuyin chose the photo of me where i dont look psychotic!